Once upon a time, “Boston Town” was an insulated New England township. But the community was destined for greatness. Between 1850 and 1900, Boston underwent a stunning metamorphosis to emerge as one of the world’s great metropolises-one that achieved national and international prominence in politics, medicine, education, science, social activism, literature, commerce, and transportation. Long before the frustrations of our modern era, in which the notion of accomplishing great things often appears overwhelming or even impossible, Boston distinguished itself in the last half of the nineteenth century by proving it could tackle and overcome the most arduous of challenges and obstacles with repeated-and often resounding-success, becoming a city of vision and daring. In A City So Grand, Stephen Puleo chronicles this remarkable period in Boston’s history, in his trademark page-turning style. Our journey begins with the ferocity of the abolitionist movement of the 1850s and ends with the glorious opening of America’s first subway station, in 1897. In between we witness the thirty-five-year engineering and city-planning feat of the Back Bay project, Boston’s explosion in size through immigration and annexation, the devastating Great Fire of 1872 and subsequent rebuilding of downtown, and Alexander Graham Bell’s first telephone utterance in 1876 from his lab at Exeter Place. These lively stories and many more paint an extraordinary portrait of a half century of progress, leadership, and influence that turned a New England town into a world-class city, giving us the Boston we know today. Humanity is a social species, like bees or spider monkeys, and we do our best work together. Cities bolster this collaborative genius by eliminating geographical barriers between smart people and their ideas. Even when cities form for utterly prosaic reasons, they can still foster the interactions that lead to our greatest achievements, from Greek philosophy to the skyscraper. 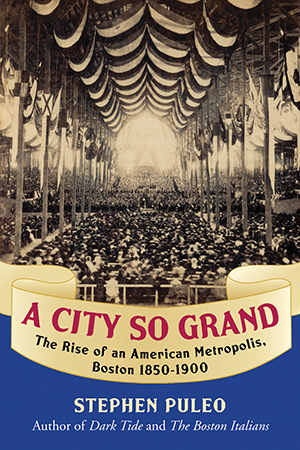 Stephen Puleo’s new book is more evidence of the urban role in civilization, as it reminds us of the remarkable accomplishments of late nineteenth-century Boston. "'No period in Boston's history was more dynamic' than the second half of the 19th century, writes Puleo (The Boston Italians) in this smoothly narrated account of that time and place. . . . Despite tensions and disasters, Boston emerged as one of the world's leading cities. . . . A thorough history." Tuesday, April 8, 1851. The conspirators would wait one more day, and then strike under cover of darkness. They knew full well the risks--arrests, fines, perhaps prison--but the justness of their cause outweighed any personal consequences, and the timing of events made delay impossible. Though hastily conceived, their plan withstood scrutiny; sound in concept, its brazenness was equaled only by its simplicity. The men stood clustered in a tight circle, their voices low, their demeanor somber, unaffected by the disbanding crowd, which still buzzed with excitement. The boisterous meeting had ended, but those who attended would long remember the thunderous speeches delivered inside the Tremont Temple this day, ten hours of addresses that represented more than rhetoric to the small band of abolitionists who now gathered in one corner of Boston’s downtown meetinghouse. To them, the day’s oratory cried out for justice and demanded action. Led by the fiery Unitarian minister Thomas Wentworth Higginson, these men saw their mission in the clearest of terms: free the imprisoned runaway slave Thomas Sims and convey him to a stop along the Underground Railroad for eventual safe passage to Canada. If they failed, Sims would be hauled back to Georgia to face punishment from his former owner and resume a pitiful existence in slavery’s shackles, a life he had fled when he stowed away on a brig that left Savannah in late February. Now, five days later, a plan had emerged to disentangle him from those clutches.